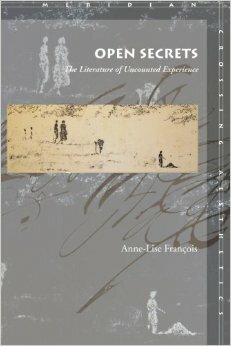 Anne-Lise François's Open Secrets: The Literature of Uncounted Experience is an ambitious, beautifully written book, whose richly textured, original argument offers an important provocation to the current mores of literary studies. Enlightenment reason and especially literary criticism are dedicated to the idea that everything should count, and the most diverse schools of criticism train us to let nothing escape. But literature is full of moments that promote a different ethos: letting be. François explores works that summon what she calls the uncountable, or the unrecountable. Their open secrets ask to be treated lightly. They disarm our exegetical impulses by declaring there is nothing to hunt for or interpret. Open Secrets shows us affinities among critical traditions that would otherwise appear antagonistic. Its detailed, persuasive accounts are a pleasure to read and also a challenge, because the book often speaks with the "affirmative reticence" it describes. François's study thereby calls for a mode of theory that values what is visible and appreciable over what can be quantified and disclosed.